What have they unleashed? One of the immediate consequences of the tripartite Unionist front dictating currency policy to Scotland is a hardening of anti-British sentiment. Those who have been pretending this is about questions of personal wealth – give me £500 and I’ll vote Yes – are realising that the real divide is between Scotland and Britain. The line-up of all of the Westminster parties AND, uniquely, the Civil Service, in an embodiment of the British state, addressing Scotland like a colony, denying us access to what is ours by right and dictating policy without negotiation, is the encapsulation of everything we detest about London rule. 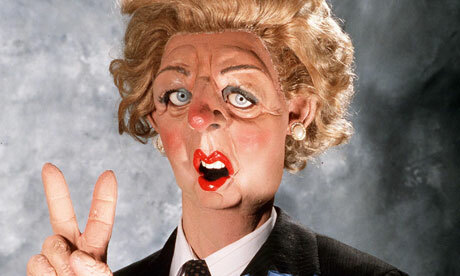 It is Better Together’s Spitting Image moment. By pulling together and stating effectively that retention of the Union supersedes all policy differences is a seminal moment. Had they come together to plead with us for a No vote, it might have been an illuminating event. But when they colluded to put us in our place with their London Master threats they may have made the second biggest mistake of the campaign after rejecting a second question. For Labour to be enrolled in a united campaign to “save the Union” is one thing. To act jointly with the Tory-led Coalition on a specific area of policy is another. A generalised, pro-Britain stance is logical for Labour but when they conspire to create individual policy along with the Tories they are getting into bed with the people who are wrecking lives in Britain. Their claims from now on to be deeply opposed to everything from the bedroom tax to salary tax rates are compromised by the alacrity with which they can co-operate when its suits them. And why is “saving the Union” a greater crusade than saving the dignity of the unemployed? Why does the perfectly normal arrangement of a currency deal supersede zero hours contracts and welfare cuts for the disabled? For a socialist what is the motivation to bury all differences with the hard right in order to send a brutal message to the Scots – that we don’t co-operate, we dictate. We don’t negotiate – we assert? I wrote this week that Balls is conflating his loathing for the SNP – and his fear of it – with the Scots generally. His message doesn’t just hit Nats, it falls on all Scots and brands everyone as somehow an enemy, even Unionists. What is the likely result? He stirs deep-rooted resentment about London diktat, brings to the surface irritations over subsidy jibes and leaves undecided Labour voters wondering what exactly it is they are supporting. Many of them are already Don’t Knows leaning towards Yes and this is a sharp reminder of how they are really viewed even by their own leadership, as dumb ruminants to be shepherded by the master’s whistle. They haven’t been able to take the next step to Yes because independence is seen as Salmond’s project – he owns it. But when their own leadership is doing the Tories’ work for them against Scotland’s interest, those doubts disappear. If they are looking for explanation from their “Scottish leader” they may look long. One of the most fascinating aspects of the whole campaign so far is the near invisibility of the “Scottish leader”. Isn’t it an amazing fact that at this critical time in Scotland’s history someone who has not long ago been anointed the first-ever “leader” of all the Scottish party has played virtually no role? Indeed, as a keen observer said to me yesterday, Ruth Davidson has played a bigger part with more interventions that Johann Lamont. One can only assume that her advisers, the some ones who have steered her into “something for nothing” and “nationalism is a virus”, reckon it’s safer to keep her out of the front line for their own sake. I am assuming that this week she will appear beside Balls and express her support and be questioned on the currency position. If she fails to, it wont only be voters who grasp that she doesn’t lead but it will intensify MPs’ contempt for her and their opposition to her Devolution Commission proposals. Tuning in to the BBC it was striking how different James Naughtie’s interviews were with Salmond and Alexander. As ever, he was beside himself with Salmond, barely letting a whole thought or sentence finish, nipping away in the background, adopting a challenging tone. It made for a frustrating listen and his truculence extended to an ironic remark about Scottish government anonymous briefings in reply to Salmond pointing out the Herald’s story that the coalition might not recognise the referendum outcome…a pretty serious development. Some of this of course is acceptable except when contrasted with his Danny Alexander interview minutes later. He was positively sheepish and I don’t think he stopped him once. Alexander was allowed to make prolonged statements, adding idea after idea, to promote party lines and criticise the Scottish government while Naughtie went to sleep. He asked what the Coalition would do if there was no agreement on the debt – would they refuse to accept the independence result – and Alexander simply didn’t answer. He answered a totally different question and Naughtie didn’t pull him up. Then Alexander made a number of unchallenged assertions including that Scotland would start off poorer because of a large deficit. I pricked up my ears awaiting the mighty Naughtie intervention but, again, nothing. Yet we know according to the FT that: an independent Scotland could also expect to start with healthier state finances than the rest of the UK. And the numbers show every person in Scotland £1300 better off immediately of nearly £6000 for an ordinary family. And of course the only reason Scotland shows a deficit in government tables in the first place is because they add in a share of their debt to our accounts. Shouldn’t a journalist have some ammunition in an interview? This Naughtie experiment isn’t working. Jim simply can’t stop himself railing against the SNP and seems to have a personal issue with Salmond. I defy anyone at PQ to listen to these two efforts side by side and say they are remotely similar in approach or fairness or that a listener couldn’t justifiably deduce there was bias. Has anyone got the balls to tell him? Or does it just confirm our worst fears that content is the last thing on the BBC’s mind? Which brings me to Kirsty Wark who produced a disturbingly strident performance on Newsnight with a cleverly patient and unruffled Salmond. Her tone was shrill, impatient and kind of patronizing, the way she might speak to her puppy if it poohed on the carpet. You know the interviewer has got it wrong when you end up watching her/him instead of the interviewee. My theory? Wark and Naughtie are used to feeling in charge, playing an interview like a fish on the line. They both know with Salmond that he is a master of the form and always has an answer, knows more than they do and will not be bested. Therefore they are all wound up in advance not to let him away with too much and the result is they get the tone all wrong, make the viewer sympathise with Salmond and look unprofessional. Shame. “If ye fly wi the craws ye’ll be shot as a craw” and if the callers to wee UKayes program are anything to go by labour voters and members are lining up to take a shot at the craws. Would that be ‘three craws’ on a union wall then? Who would listen to Balls? ‘In the real world’, £1.2Trn debt. Osbourne came to Scotland said nothing, and went away. Haste ye back, even more Yes votes. Shame indeed – couldn’t agree with you more. Almost missed the questions since the tone of both was so strident and Wark’s cutting Salmond off was simply impertinent. I think it’s true to say most voters will not actually work at informing their opinion, so to some extent the BBC is giving them the auditory equivalent of blaring newspaper headlines, except the inexorable effect of such interviews in the next six months will be the corollary of what they expect. Wark is still livid that her pal, Jack McConnell, was beaten by Salmond in 2007. Her post-election interview with Salmond was hilarious, and her shrill carry-on last night was a reminder of it. You can understand why Wark was/is so furious – she has probably missed out on freebies to Malawi where Lord Jack was going to become Governor General, District Commissioner, Emperor of All Tribes or something. I don’t know why these No sympathisers try to play this game with Alex Salmond. he is a master of the game, a consummate politician, well informed and more wily than they could ever be. if you punch above your weight you only end up looking foolish. Yes doesn’t mean Yes, now. Hilarious! After the non-publication of the Balen report, my expectations of the BBC for impartial journalism are vanishingly low. But Kirsty Wark going on holiday with the then First Minister was the icing on the horse apple. But we are living in interesting times. With the SNP occupying the “Scottish” summit, and other parties increasingly ceding it to them in favour of a “British” high-ground, there is a risk that a No vote could lead to people rationalising their decision (which might be motivated by more immediate financial concerns) to vote No by adopting a more British political identity. It would go against the run of how national identities were developing in the UK, but the No parties are painting the dividing line so starkly that a “No” is becoming more than a “No, not just yet”, it’s becoming a No for all time. How often can Salmond get away with the Briar Patch ploy? You would have thought that UKOK would have jaloused by now. it’s great entertainment watching them tying themselves in knots trying to deal with these slippery colonials. Many of us have been banging this drum for a while, but Westminster’s, BTs and the media’s collective tactics are causing enormous social division and bitterness. And no its not going to disappear overnight either. Worse, on any no vote win and especially a narrow margin, think on what the next twenty years will be like as austerity bites deeper and Holyrood is muzzled and hog tied. Further governments of all stripes we didn’t vote for imposing measures we don’t want. Any further referendum vote (should we ever be allowed a second chance and that’s doubtful on today’s releases), would be a landslide YES, but the bitterness and social carnage between times will be awful. Think of Scotland’s response to 79s broken promises doubled and then some. As for the media’s treatment of the SG in the past 48hrs and most especially their senior interviewers techniques? Were we really all that surprised? Cameron, Osborne, Balls, Alexander, Darling and the whole lot of them in Project Fear have deeply wounded Scotland in a way that will never ever be forgotten by the people of Scotland much as the people of Ireland still remember what the British state did to them. “they may have made the second biggest mistake of the campaign after rejecting a second question.” That is absolutely spot on Derek. It looks to me like Salmond is playing Westminster like an old fiddle. Spider and web come to mind. Looking forward to the third big mistake from the UKOK’s. I certainly wouldn’t think of playing poker with Alec Salmond nor chess! Did I really hear Dr M Kelly say on Newsnight that we should use the dreichma because our weather was worse that that of Greece and so would be our economy? Did he then say that Scottish Labour after a Yes vote would vote against us using the pound EVEN IF IT WAS IN SCOTLAND’s BEST INTEREST? He was really on a roll, wasn’t he? Nothing like a posh tory scowlfest to get old Slabs…, er, excited. ‘Shouldn’t a journalist have some integrity in an interview?’ – fixed that for you. Naughtie was a poor choice, the results inevitable. Wark – what can you say? She hates Salmond for his superior intellect and knowledge, and for what he did to Jack. Her tone and attitude betray her. She is a mere journalist (no offence to the profession generally), unelected and with no accountability. She should remember that, and treat all elected officials with at least the respect they deserve; having both mandate and accountability. Wark, Naughtie nuff said. My ‘treat’ was sucker punch. Kelly posited a fascinating scenario wher Scots MP’s & MSP’s would, AFTER A YES VOTE, continue to side with the triumvirate (osborne,balls + Alexander). This sets up a most bizarre situation in which UKLabour members in Scotland see their loyalty to Party first, then (if at all) to their constituents. Only saw Salmond v Wark and she was the fish. In the vernacular, “she was done up like a kipper”. And Salmond also set the ball rolling for YES into options other than a Currency Union along with the veiled threat, “no share of assets no share in UK debt”. She very nearly had kittens then and was cut off shortly after, presumably by her director. Wark has “form” with Salmond. Remember Newsnight a few years back when he appeared and she started with a shouted question at him. He calmly said “Good evening Kirsty” showing up her bad manners. I bet she’s never forgotten that putdown. Good piece. Did you see Scotland Tonight on STV? They covered Osborne’s statement, but then did a piece on how he took only 3 questions and this was a pattern with recent visits. Showed him scuttling out of a side entrance into a taxi refusing to respond. Rona Dougall than asked tough questions to Danny Alexander and to Alex Salmond. Danny Alexander looked seriously discombobulated. The BBC has of course been unquestioning on a story they cooperated with the three Unionist parties to set up, they were trailing it for 3 days in advance. Will they cover the leak on not accepting a Yes vote? Doesn’t look like it. They’re all so full of their own importance they just can’t see that AS is wrapping them – tightly – in silk thread and setting them aside to be devoured at a later date. Their problem is simply their arrogance. To which I might ask, is there another name more onomatopoeiacally appropriate than ‘Kirsty Wark’? I was alluding to the sound of her name rather than the sound of her voice. Although I have long acknowledged an association, admittedly not 100%, between a certain kind of nasality and unionist support. In the course of one week we have gone from love-bombing to being carpet bombed with napalm!…A coalition government source tells the Herald that even a Yes vote would not be accepted by Westminster, while the Daily Mail accuses Salmond of hiding yesterday; when in fact he appeared on at least two different television channels (ITV and BBC 2)! Yet again Kirsty Wark has a complete train wreck of an interview with Salmond, where she oozes disdain, and is the personification of the arrogance of the British establishment. Naughtie jumped that particular shark a long time ago of course. To cap it all off BBC Scotland continue to suggest that Scotland will be forced to join the Euro if we vote Yes. They should really rename themselves BBC Reporting Disinformation. I agree the Naughtie experiment isn’t working. He is a fish out of water on GMS. The story in the Herald is far more disturbing than the hoo-hah over currency. This is the British state letting Scotland know in no uncertain terms that it will not escape and that in their master-like eyes we are no more than a slave nation. They are saying they own us. They can do what they want, even ignore the result of a legally constituted referendum The act of union 1707 is no more than a certificate of ownership for a nation bought 300 years ago. Anyone who now declares themselves a NO supporter will find it hard to have a listening audience in Scotland. Forgot to say that last night on STV Danny Alexander looked as if someone had already removed a chunk. Almost felt sorry for him. Could never feel sorry for that sell-out. He has a face you could happily slap all weekend and an attitude to match. Scotland is merely a possession of the British state. That should be obvious to the people of Scotland now. They can’t say haven’t had it directly from the horses arse muttley, (cough) mouth. Kelly on Newsnight insisted that Scottish Labour after a YES vote and during the ensuing negotations would veto Scotland using the pound EVEN IF IT WAS IN SCOTLAND’S BEST INTEREST TO USE THE POUND! Also a crass remark about the currnecy being the dreichma – weather worse than that of Greece as would be the Scottish economy! Oh dear oh dear. How do you actually acquire or develop a mentality like that? It’s incomprehensible. The Greeks at least have some national pride. I think, Morag, that there is a significant minority in Scottish Labour ranks who never acquired a Scottish identity when growing up, but instead an antipathy to Scottishness. Hence the reason that the likes of Kelly can come out with such hostility to Scottish nationhood, and Hood can say in Parliament that he didn’t care whether his constituents would be better off, he would still prefer the Union. I have met people like that. Thankfully they are growing fewer as time goes on and more people realise that it’s not about ethnicity, but what’s best for all the people who live in Scotland. I think we all know why Jim Naughtie was “seconded” to GMS. He was supposed to add a touch of metropolitan edge to the Jocks’ political diet and put those nasty separatists at Holyrood under searching forensic scrutiny. The only surprise is how bad he actually is!. And an electron ran along the Scottish Labour benches looking for a neuron to fire on. Well Radio4 Today gets rid of him two days a week – for them its a start. For us its wasted airtime. Just when you think you have imagined every possible thing you could put in a sentence someone surprises you! That should,of course, be “towering” but yowering could be right! Yowling? The stinking pile of unionist corrupta which comports itself as being democratic, is now in full slobbering bray. My thoughts ion Gideon weilding his sword. the hats with their initials on them chic, what are you trying to say dear boy? Erm, that I’m not confident enough in my drawing for folk to recognise them. Oh, I think I see what you were getting at. ACDC means something doesn’t it? Bisexuality? Never been very sure. Totally coincidental. There is also an Aussie/Scottish rock band called that, not a fan, but I know about them because their one time singer came from Kirriemuir and there is an annual festival in his memory. It wasn’t about them though either. Not one person above can bring themselves to the realisation that most of the population of Scotland are not interested in change ! Small minded bitter Scots with simmering resentment of England & Tories in particular. Insults are bandied around when anyone questions the Yes vote and quite frankly the thought of these people being the backbone of a sovereign nation is frightening. I must disagree with you. I neither small minded nor bitter and I want change in Scotland. I want food banks rendered redundant. I want a democratically elected Scottish Govt. to manage Scotlands affairs, on a four year term basis. I want mutually beneficial, good terms with England, Wales, Northern Ireland and the ROI too for that matter. Europe too. Here’s what I don’t want: Scotland run by a bunch of London-orientated ex-public schoolboys, whether they are English, Scottish or whatever. I would suggest it is you who are small minded, and indeed bitter, as many labour voters in Scotland have revealed themselves to be in recent years. The first think the “backbone of a sovereign nation” needs to fulfill that function is a backbone, something either you lack or your from England and as such your opinion is welcome but ultimately irrelevant have a nice day. It is important to be careful in making references to the Civil Service in this debate. Civil servants are also supporting Ministers in the Scottish Government. And I bet those civil servants who helped draw up the Scottish Government’s White Paper are non too pleased with their Treasury “colleague” going public with confidential advice . . . I wonder how many screaming headlines about abuse of civil service impartiality there would have been if a Scottish Government civil servant had agreed to their confidential advice on currency being made public to bolster the case for independence? When you see the three main Unionist parties aligned, I think I understand what ha happened and what that realisation means. All three have been fully briefed and now understand the catastrophic implications to rUK of Scotland leaving the Union. The financial impact will be horrendous and have severe domestic and international ramifications. One small impact is the dawning to every one on these islands that there have been black lies about Scotland’s status and contribution to the UK. Instead of being subsidy junkies we have, in fact, been a significant contributor. Only the break up of the Union will show this fact to the populace. The most sickening aspect of this is Scottish politicians parroting the same lies and selling Scotland down the river. Once we get Independence should we have an amnesty for these folk or a treason trial? Democracy is a matter reserved by and to Westminster. Tories saying you can have your referendum but they will decide whether they will allow us to implement it and under what conditions. They just can’t help themselves,bullying comes naturally to Westminster Tories and now it appears also to the Labour and Liberal MPs who infest that establishment. They are desperate to hang onto us. Why would that be I wonder ? I worry when power threatens a democratic voice, opinions harden and courses of action become limited and more extreme in order to make the voice heard. It is clear that the source threatening to disregard the vote and the swift denial were two parts of the plot to send out the message and leave it lingering with a veneer of respectability over it. Deny people a legitimate voice at your peril, the struggle for legitimate power can turn ugly and that is neither desirable or inevitable. Add Kaye Adams to the list of Unionist interviewers. She was beside herself attacking Alex Bell, the most genial and intelligent of men. He dealt with her calmly – making her sound like a journalist way out of her depth and seriously lacking impartiality, like her colleagues Kirsty Wark and Jim Naughtie. We’re leavin’ the UK see ya! We”re leavin the UK see ya! etc. My first thought when I saw Michael Kelly representing BT was one of surprise.I would have thought they may have been able to have one of their own business supporters to match the Business for Scotland representative. My surprise turned to amazement when I heard him say that in the event of an Independence vote and a Labour victory in the UK election he would expect Labour MPs and MSPs to support Ed Balls refusal to have a Currency Union with Scotland. I am sure that will have pushed a very big number of wavering Labour voters into the YES camp. As for Kirsty Wark, well it has all been said before. Unfortunately for her, we have in Alex Salmond possibly one of the best politicians to grace the Scotland and UK stage in the 50 odd years I have been taking an interest in current affairs. totally agree about the naughtie interviews. he was practically answering the quedtions he put to alexander himself. and alexandet saying we would be so poor and get poorer. lovely! I regret to say that many Labour voters support their party the way they support a football team i.e. they will ignore policy content and vote for familial loyalty. Little details like Labour’s stated anti-Scottish intentions will never get through to them and even if it did they would rationalise this the same way that Communists used to rationalise mass murder and lies. BTW Derek, I think you are spot on with your comment on Kirsty Wark – she is just outclassed by AS and she knows it and dislikes him for it. cant agree with you there setondene in spite of the tribal and some might say bizarre loyalty shown to the poor labour candidate (Cara Hilton) in Dunfermline the responses on the doorsteps should a majority (sorry cant remember the numbers) in favour of Independence, so because of the cognitive dissonance of voters on occasion it would appear that in the labour heartlands (god only knows why) even there the people disagree with their party of choice. Watched Brillo and his colleague interviewing Sturgeon and was struck by the aggressive and hectoring questioning and the interruption of her answers and yet when the Tory MP was being interviewed the tone changed and he was even prompted about Scotland’s contribution to the UK. He was not interrupted and neither was the English Democrat. Brillo had to go back to things that were said by SNP Ministers,in 2006 and 2009 to ask Sturgeon if her colleagues were wrong. The past is another country and hopefully the future will see a new country. Sorry, should have added in my usual fawning manner – I’m glad you’re on our side! I saw Kirsty Wark’s interview with Alex Salmond last night and I came away with the impression that Kirsty simply didn’t know enough about the currency issue or didn’t understand it enough to ask intelligent questions about it. At one point, she asked Alex Salmond a question. He answered it clearly. She frantically began searching her notes whilst asking the very question he had just answered. Was she not listening or did she just not have a good enough grasp of the subject matter to manage the interview? I certainly got the impression it was the latter. She seemed very much out of her depth. I suppose to be fair to Naughtie, Alexander’s witterings send me to sleep too. A correspondent in the Courier letters page this week, while defending Cameron, described Salmond as a dissident. I had to read it twice as I found it a staggering comment to make in reference to a First Minister with a mandate Cameron and co come nowhere near matching. The propaganda aimed at diminishing Salmond may have worked on this individual, but Scottish official policy, backed by the Scottish electorate, is being undermined by a Westminster cabal who are more deserving of such a description. What next? A gunboat sent to the Clyde- rebelious Scots to quell. can we get a wee loan of the Potemkin dae ye think? ‘Naughtie is a Numpty’ – now wouldn’t that make a nice headline for your next piece? However, I was delighted to see TV journalism in naked tooth and claw last night – and it was great to see! Check out Bernard Ponsonby and Rona Dougall sticking it to the English Chancellor and his whipping boy last night!! That would be Handel’s (virtually English wasn’t he?) Messiah. We won’t mention his ‘Entry of the Queen of Sheba’ composed after Handel’s Highland tour, and which is virtually a Strathspey with knobs on. Neither will we mention that bloody chorus from “Judas Maccabeus”. Well in that case can he come out then? Fear not, Derek, the Scottish Labour leader is coming out of the bunker soon. On 25th February, STV will run their next referendum debate. This time it will be Nicola Sturgeon against Joanne Lamont. This will be well worth seeing. No doubt Joanna Krankie is being tutored right now in Labour debating skills – answer no questions; make non stop allegations that damn the SNP; talk over all of Nicola’s answers so the viewers don’t hear them. I’m getting the provisions in already for this one! It’s a must see. I know it’s a different type of broadcasting, but I do enjoy Sue McGregor and Edi Stark. 1 out of two isn’t bad. Hmmm Janice Forsyth, Glasgow, 80’s, obsessed? Much? I think Nauchtie is using his part time attack dog sojourn in Scotland as an extended audition to be the replacement for Stephen Nolan on Radio 5 Live. That new avatar really slays me, Irene thinks its hysterical as well. Thank you for your blogs. They are inspiring. An anecdote for you – my mother, a life long labour voter and hater of Alex Salmond phoned me tonight to tell me that she was so angry about Osborne’s speech that she will now be voting Yes. If my mother is going to vote for independence we are going to do this! for a man like Quisling to lend his name to traitor to his own country, add Kelly’s and his name will be synonymous with people who loath their own country. Its time someone in the media actually challenged the BT myth that an independent Scotland couldn’t bail out the banks. We need an article from a creditable non political source in the MSM to spell out (again) that Scotland wouldn’t have bail out any more than 10% and at the time that would be £8 billion out of GPD of £145 billion. Also point out it was the UK regulatory authorities headed by Chancellor of Exchequer Alistair Darling that had the powers to investigate the RBS / AMRO take over but ignored fact that no due diligence was done by RBS on a deal worth £49 billion before they gave its approval for the world’s biggest bank take over deal that brought about the collapse of the Royal Bank. Incredibly, the FSA overlooked the UK Treasury rules on capital by allowing Goodwin and RBS to dip below 4%, below the minimum regulatory requirement on capital, to do the ABN Amro deal. So much for relying on the UK regulatory body. So Barroso links Scotland with Kosovo? Catalonia has it rougher: our foreign minister has linked Catalonia post-Yes with Abkhazia and South Ossetia (Caucasus, in case you didn’t know) and Somaliland. Nice to know their looking after our interests! So I complained to the BBC using their online complaints process. Having digested the reply, I do continue to feel differently. I’m now left wondering if Gerard Magennis was listening to the same programme and also wondering of his previous job was as a primary school teacher. Complaint Summary: James Naughtie’s interviews. I listened to Good Morning Scotland yesterday, Friday 14th Feb. Jim Naughtie conducted two interviews on the current referendum topic about whether or not Scotland can use the pound after a Yes vote. Having listened to the both interviews I find it quite shocking how he continually interrupts Alex Salmond and adopts a very adversarial tone. He then interviews Danny Alexander in a convivial manner with one half hearted attempt at an interruption throughout the whole interview. Alex Salmond had to work very hard to get his points across and Danny Alexander was given such an easy time he might as well have been allowed to make a speech. Bias like this is not appropriate on Radio Scotland at this time or any other time. I think James Naughtie should be taken off this programme as he is obviously incapable of holding his own bias in check. I expect a higher standard of professionalism and fair play from my licence fee. “Thank you for getting in touch. James Naughtie’s interviewing style is certainly combative, but this is a style he uses with all his guests, regardless of which political party or other organisation they might be representing. Mr Naughtie and indeed the rest of the editorial team are well aware of the BBC’s commitment to impartiality and the maintenance of the highest journalistic standards, particularly at this important time in Scottish politics. While courtesy should always be observed, it’s worth noting that politicians are no less professional in handling questions than our presenters are in posing them. The task of informing the public sometimes demands a degree of persistence which would be out of place in ordinary social conversation. Mr Naughtis’s job is to ask the questions likely to be in the minds of informed listeners, and to seek answers. This can lead to forceful and persistent questioning, but in our experience politicians expect their views to be scrutinised and they respond with corresponding firmness. I realise you may continue to feel differently but I hope my response goes some way to explain our view and the thought that goes behind such matters. Thank you, once again, for taking the time to contact us”. I could not believe the sheer mendacity of BBC/BetterTogether’s Reporting Scotland lead item this evening -gleefully falling over themselves to tell us that “Standard Life WOULD leave Scotland if it voted for independence”. NO THEY WOULDN’T, THEY DID NOT SAY THAT!!! In their press release SL said “…we COULD transfer PARTS of our operations if it was necessary to do so. This is purely a precautionary measure…”. Next theBBGlee reporter gave the response of two members of the public, one elderly woman said it would be a disaster if all the jobs were to go, and another woman said it was crushing to the Yes campaign. We never heard the question which was put to the women, only their replies (no doubt Prof John Curtice would term this as “leading” if it emanated from a Yes interviewer). Were their no positive responses from members of the public who supported independence or did the BBC only use those which suited their purpose? The Beeb has clearly gone viral in it’s manipulation of news, it has gone from reporting news to making it up to suit their unionist agenda and STV were no better. Do they think the Scots are not genetically programmed to identify utter mince when they hear it? Roll on the Yes vote in September, until then the Scottish MSM will only get worse. Thank goodness their is some honest debate to be found with on-line forums.